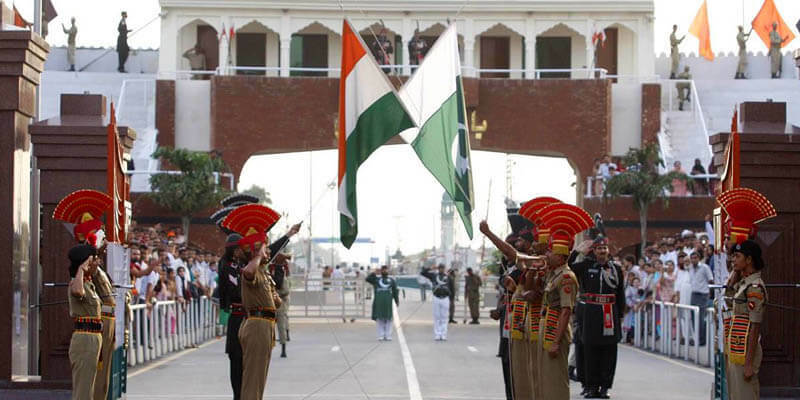 The India-Pakistan relationship, since the creation of both the nations in 1947 has been rocky, where the nations have been involved in four wars. 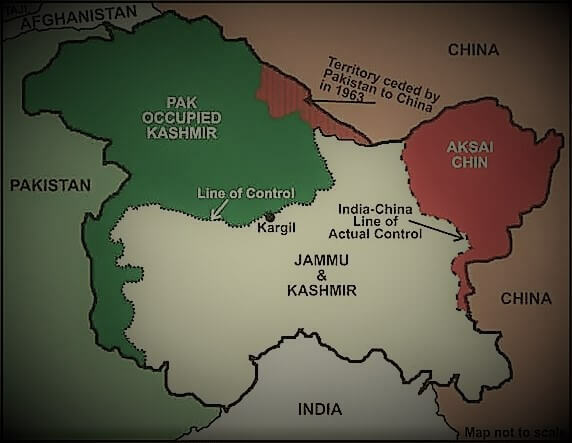 Kashmir has been the bedrock issue between both the nations and has been an unresolved boundary dispute. Terrorism, particularly targeting India which is bred on Pakistani soil is yet another major issue which has mired the relationship. Despite many positive initiatives taken, the India-Pakistan relationship in recent times has reached an all time low with some sore issues sticking out. Here we are analysing the core issues in the India-Pakistan relationship. With the regime change in India, there was a perception that a hard line and staunch policy towards Pakistan would be followed. However, the current Prime Minister (PM) of India put forward the idea of ‘Neighborhood First’, which was particularly aimed at improving relationships within the Indian Subcontinent. There were initiatives taken by the government, for example, inviting the Prime Minister of Pakistan for the swearing in ceremony of the new PM of India, an unscheduled visit to Lahore by the Indian PM to the residence of the PM of Pakistan, which showed some signs of a positive development. However, with the attack on the Indian Air Force Base in 2016 (Pathankot) January, just a few days after Indian PM visited the Pakistani counterpart, events thereafter haven’t been really encouraging. There has been a complete stoppage of talks at all levels in between the nations. Speculations, however, run that back channel talks exist. With rising discontent and a volatile situation once again in Kashmir from mid-2016, India has accused Pakistan of adding fuel to the unrest and glorifying terrorists by declaring them, martyrs. The case of Kulbushan Jadhav, a retired Indian Naval officer arrested nears the Iran-Pakistan border in Baluchistan region by the Pakistani establishment and accused of espionage by Pakistan. For quite a while, the Panama Papers issue was being raked up in Pakistan and the PM Nawaz Sharif of Pakistan was alleged to have received unaccounted money from abroad. The Supreme Court of Pakistan recently disqualified the PM from office, making him the second PM in the history of Pakistan to be disqualified from office. 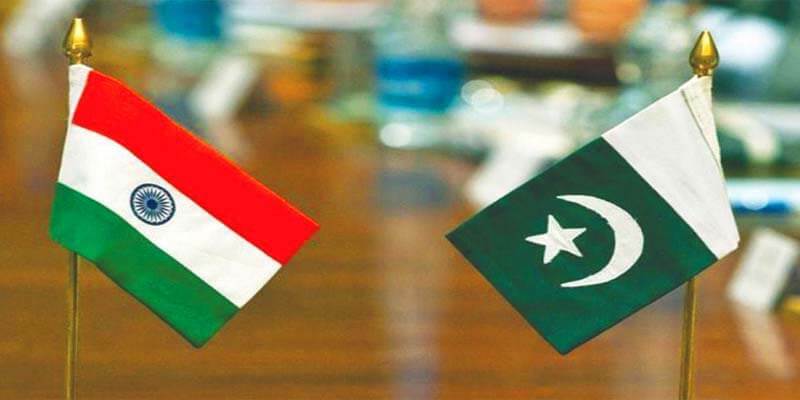 This backdrop comes at a time when the already existing India-Pakistan relations are at a low and with the disqualified PM being perceived as someone who has always wanted to improve the relationship with India, it is not a good news for India in a way. In the ouster, surprisingly, the Pakistani Army has remained silent publicly on the issue. However, in the Joint Investigation Team created by the Supreme Court of Pakistan, there was the presence of a Military Intelligence Official and an Inter Services Intelligence (ISI) Official, which shows that the influence the military establishment still continues to have a strong hold in Pakistan. Some people perceive the judgment of the Supreme Court of Pakistan, as being politically motivated, with some saying there was a judicial overreach by the Court. Also, the court has directed the National Accountability Bureau to further investigate into cases related to Panama papers. However, there are also reports that the developments are a sort of deepening the roots of democracy in Pakistan because the due process of law was followed. The disqualified PM was seen as someone who tried to pursue a better relationship with India. Thus, his ouster can have implications with the incoming new PM of Pakistan. This can be a cause of concern because of the background scenario with the relationship between both countries already fraught and the Pakistan Army indirectly flexing its muscle in the process of the ouster of the PM. The future thus remains uncertain. 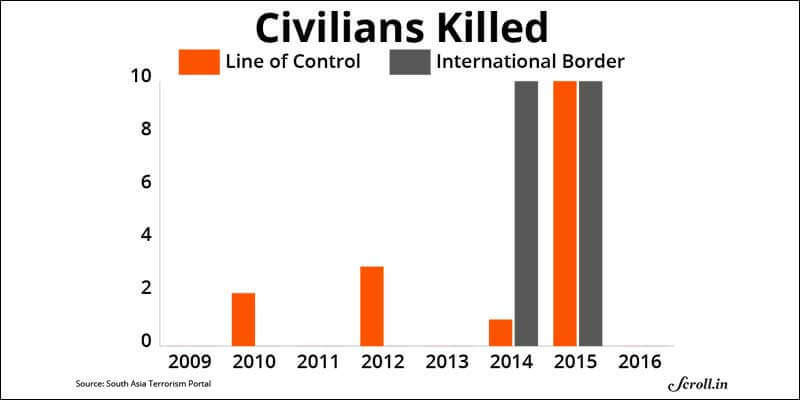 Cross border terrorism has always been an issue. Some analysts go to the extent of saying that both nations are always in a perpetual state of war. 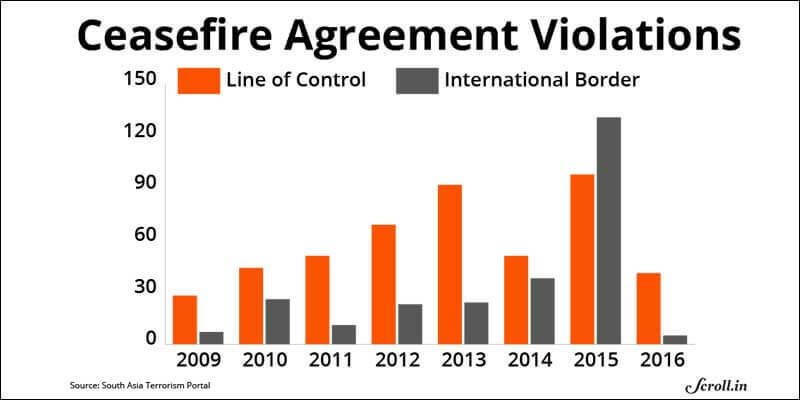 Despite the fact the after the Kargil conflict, there was a Ceasefire Agreement signed in 2003, there have been regular cross border ceasefire violations from the Pakistan side of the border with the trend being as such that since 2009 onwards, there has been a rise in the violations (with the exception of 2014). 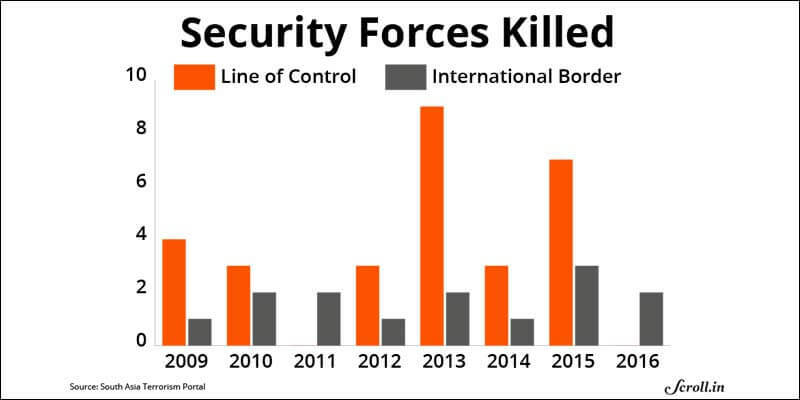 It has killed and injured security forces as well as civilians on both the sides. With the regime change in India, there has been a different approach to the violations. With the hardline policy of the new government, there has been massive retaliation to the unprovoked firing. Thus, out of desperation, there has been a rise in the number of infiltrations of terrorists from across the Line of Control (LOC), which has been routine for quite a while now. With the void in between the Kashmiri people and the establishment increasing after the devastating floods of 2014, there was rising discontent again in the valley. The trigger to the events was the killing of the militant commander of the terrorist organization Hizb-ul-Mujahideen Burhan Wani, which led to widespread protests in the valley and the situation has been highly volatile ever since with almost daily scenes of protests and stone pelting in the valley. Pakistan has taken advantage of the situation and has fuelled the protests by providing the elements fighting against the Indian establishment and Forces in the state with all sorts of possible support. The PM of Pakistan, in fact, went a step ahead and during the United Nations General Assembly meeting of 2016, declared Wani as a martyr and the struggle of the people of Kashmir as an Intifada. This is in sync with the stand Pakistan holds on Kashmir i.e., to internationalize the issue of Kashmir and asking for holding a plebiscite in Kashmir under Indian administration to decide the fate of Kashmiri people. The stand has been rejected by India as it says it is in direct violation of the Shimla Agreement of 1972, which clearly mentions that peaceful resolution to all issues will be through bilateral approach. After the attack at the Pathankot base in 2016 January, there was again a thaw in the relationship, especially when seen in the context that the Indian PM paid an unscheduled visit to Pakistan to meet his Pakistani counterpart. With Kashmir already on the boil and Pakistan adding fuel to fire to the situation, the attack on Uri Army camp in September 2016 in which 19 Indian soldiers were killed made the Indian PM declare the statement that ‘talks and terrorism’ cannot go hand in hand. This was followed by surgical strikes carried out by the Indian Army across the LOC targeting the terror infrastructure in Pakistan occupied Kashmir (PoK). They were carried out at the end of September. In a first, India tinkered with the Indus Water Treaty, a Treaty which has stood the test of time and the bitter sour relationship for more than 55 years and was pondering with the fact to fully exploit the water potential of the West flowing rivers over which Pakistan has control. Thus, the fact trickles down to the point that India has its stand that until Pakistan doesn’t do enough to tackle the terrorism menace, there can be no talks held in between the nations. On the other hand, Pakistan is ready for a dialogue with India but it wants the inclusion and discussion of the Kashmir issue which it keeps raking up every time. The case of Kulbushan Jadhav, a retired Naval officer arrested nears the Iran-Pakistan border in Baluchistan region by the Pakistani establishment. He has been accused by Pakistan of espionage and spying and has been sentenced to death by a military court in Pakistan. India, on many previous occasions, demanded consular access of Jadhav, a demand consistently rejected by Pakistan citing national security issues. India says that Jadhav was a retired Naval officer who was a businessman working in Iran and has been falsely framed by the Pakistani establishment. As there were repeated denials of the Consular Access, India approached the International Court of Justice (ICJ) at Hague where it put forward the argument that Vienna Convention was being violated as the Consular Access was denied. The ICJ has asked Pakistan to stay the execution of Jadhav and the matter is sub judice. India and Pakistan are neighbours. Neighbours can’t be changed. Thus, it is in the better of interest of both the nations that they bring all the issues on the drawing board and resolve them amicably. India wants Pakistan to act more strongly on the terrorism being sponsored from its soil. Also, India wants Pakistan to conclude the trial of 26/11 sooner so that the victims are brought to justice and the conspirers meted out proper punishment. India has genuine concerns, as there are internationally declared terrorists roaming freely in Pakistan and preaching hate sermons as well instigating terror attacks. With the international community accusing Pakistan of breeding terrorism on its soil, Pakistan cannot remain in denial state and thus, needs to act tougher on terrorism related issues. Composite Dialogue Framework, which was started from 2004 onwards, excluded, some of the contentious issues between the two sides had resulted in good progress on a number of issues. Delhi-Lahore Bus service was successful in de-escalating tensions for some time. Recently, the ‘Ufa ‘Agreement’ was made during the meeting of the National Security Advisors of both nations at Ufa, Russia. Early meetings of DG BSF and DG Pakistan Rangers followed by the DGMOs. Discussing ways and means to expedite the Mumbai case trial, including additional information needed to supplement the trial. Ufa Agreement has now become a new starting point of any future India-Pakistan dialogue, which is a major gain for India. However, despite all the initiatives, there is always a breakdown in talks. Thus, more needs to be done for developing peaceful relations. With India and Pakistan both being two Nuclear States, any conflict can lead to a question mark on the existence of the subcontinent as well as the entire planet, especially with the border being ‘live’ almost all the time. If there is peace at the border and a solution of Kashmir is arrived upon, then the China Pakistan Economic Corridor, which is passing through Pakistan Occupied Kashmir (PoK) can certainly benefit Kashmir, its people and the economy. Kashmir can act as a gateway to Central Asia. Turkmenistan-Afghanistan-Pakistan-India (TAPI) pipeline which originates in Turkmenistan and passes through Afghanistan, Pakistan before reaching and terminating in India can also get huge benefits as it can help secure the National Energy needs of both Pakistan and India, which are potentially growing nations with increasing needs of energy. Iran-Pakistan-India pipeline is another project, which is currently stalled. If relations are cordial, then this pipeline can also supply the energy needs of both the nations. A stable Afghanistan is in the best interest of both Pakistan as well as India. Terrorism is affecting both India as well as Pakistan and the porous boundary between Afghanistan and Pakistan provides a safe haven for terrorists. Also, a better relationship with Pakistan can give direct road access to Afghanistan. Currently, India has to go via Iran to Afghanistan to send any trade goods and vice versa. South Asian Association for Regional Cooperation (SAARC) and the initiatives taken by the association will start to hold more relevance as the same hasn’t lived up to its expected potential as the elephant in the room during any summit is sour in the India-Pakistan relationship.